Words are just that: words. By the way we choose to embody these words, we bring them honor and value. Some ideas in religion are simple. They just make sense. Declare that honest words are better than lies, and most people will nod. Rank forgiveness over bitterness, and you leave little to debate. Open the Bible and quote passages about loving the neighbor, and few people will disagree. But say that God came to earth as a human? That’s a lot more to swallow. Say that this Human-God performed instant healings on the sick, raised the dead, turned water to wine, and rose from the grave? Accepting these statements requires a willingness to embrace some paradox. Just imagining God as human may be the biggest paradox of Christianity. 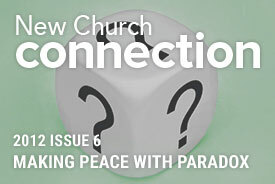 Questions of faith and paradox may also arise when reflecting on the messages of Swedenborg. Certainly, some of his themes enjoy quick acceptance, especially for readers with an affinity for justice. There’s the merciful notion that you don’t need to be of one particular religion to be “saved.” There’s the inspiring idea that faith means nothing when stripped from charity and kindness. And beneath it all, there’s the beautiful and resounding message that love is at the core of the human experience. Other aspects of Swedenborg’s writings, though, may seem to require a softer lens. Out-dated scientific analogies, or passages that appear to negatively stereotype races or groups, for example, might leave a conscientious reader with a furrowed brow. Especially for those who regard Swedenborg’s writings as divinely inspired, the acknowledgment of his human limitations may involve somewhat of a paradox. For this issue of faith and paradox, I interviewed six people who have been inspired by the teachings of the Bible, and of Swedenborg. Each offers his or her approach to the paradox inherent in regarding text as sacred. Thomas Mueller - Thomas was born and raised in Germany, and came to the United States for college. After reading about Swedenborg, Thomas transferred to Bryn Athyn College, where he is now a Senior. He plans to get his Masters of Divinity in an interdenominational seminary, and bring Swedenborg to a wider Christian context. Bill Radcliffe - Bill is a retired diagnostic radiologist who lives in Maryland with his wife of 52 years, Dorothy. They have 4 adult children and 11 grandchildren who all live in the same metropolitan area. With a lifelong affection for learning about different cultures, Bill appreciates teachings that honor the various religious traditions. Shada Sullivan - Shada grew up in Australia to parents who were New Church members. After moving to the United States, Shada earned her Masters of Arts in Religious Studies at Bryn Athyn College, worked as a hospital chaplain, and now offers her talents at New Church Live in Bryn Athyn, Pennsylvania. She is passionate about justice, and believes in a loving God who cares equally about everyone. June Johnson - June grew up in Australia, was baptised as a baby into the New Church, and was raised in both the New Church and the Church of England. June has worked in both business and education, and currently works as the secretary of the New Church in Adelaide, Australia. One of her dreams is to help spread God’s message of divine love and wisdom, particularly by bringing the theology to a level that young people can easily understand. Carla Augusta Friedrich - Carla grew up in Florida with a strong affection for nature and an appreciation of Swedenborg’s doctrine of correspondences. Carla is currently working in ministry in both Mexico and Arizona spreading Swedenborg’s writings in a “green” way. Her efforts are directed toward a sustainable earth (care of creation), sustainable structures (organizational, educational, and architectural) and sustainable lives (children and community). On Swedenborg: How do you view the Writings of Emanuel Swedenborg? TM - What makes it easy for me to take Swedenborg seriously is that he doesn’t require blind faith. If I encounter something in Swedenborg’s writings, and I can’t reconcile it with my beliefs, I like knowing that I don’t have to either fully reject it or fully embrace it, but I can just hold it lightly, knowing it may be useful at another time. I think if someone were to take Swedenborg too literally, a lot of his great insights would be lost. JJ – I do think that Swedenborg was inspired by God to do all that work, but I’m also very aware that he was an intellectual. When I read some of his writings, I can see that it’s from him and his life experience and how he thinks. But the fact that he’s given us such a gift, and spent so much time trying to help us understand God’s laws, that is just wonderful. SS – I look at whether the doctrines as a whole make sense. That’s what’s important to me - taking a more holistic view. BR – When I picked up and read a copy of Heaven and Hell, I recognized right away that this was a dynamite book. There was no way getting around the basic choice: either this was true, or the delusions of a deranged fabulist. I went with true. But I also see that Swedenborg uses copious examples to illustrate abstract ideas and many of those examples and illustrations clearly reflect the 18th century culture. How much then is from the Lord how much did he need to intertwine his own thoughts and experience to convey truth? Possible answers can be looked on as a spectrum from, on one hand his directly writing down the word of God as he hears it, to the opposite pole, looking upon him as an outstanding philosopher-theologian who, like others, has many good ideas. As a church organized around his written works as divine revelation we have to be somewhere between those two extremes (even our more conservative clergy don’t think Swedenborg took dictation), and every person has to find the point at which she or he is most comfortable. CF – I hold the Writings as true and as having divine authority in my life along with the Word. To solve the paradox of contradictions, I have begun trying to read them in the same way that I perceive Swedenborg as reading Scripture. I read them with the Lord’s qualities as a lens. This is a lens of love and wisdom, mercy, freedom, innocence, healing wholeness and peace. As I read with all these in mind, I know that nothing I read should do violence to the Word, or divide God, or fracture individuals, churches or families, but should bring wholeness and healing. LJ –When I first read Swedenborg’s Writings in middle age I recognized them as divinely inspired. However, like the New Testament that I first read a year earlier, I had to excuse and ignore what seemed like anti-semitism, racism, and male gender bias. But about two years later I came across a magazine published by the New Church called De Hemelsche Leer. Through the explanations given in that publication, I was able to see that every word in the Writings was most sacred, and further, the Divine Human Himself as the Word was in every word and expression of the Writings. NOT in its literal sense, but in the underlying correspondential sense. Now I was fully happy, fully integrated, fully alive. There were no cultural and scientific conflicts in the literal sense, only wisdom to be mined for. On Biblical Paradox: How do you navigate biblical paradox? SS – When trying to reconcile the Old Testament God with New Testament Jesus, I always think, “I believe in a God of love. There is no other God I could believe in. If that’s the case, how can the rest of this be interpreted?” Still, I understand that other people may feel that’s a kind of mental gymnastics that they’re unwilling to do. There are other aspects of the Bible too, that might bug me as a scientist not to understand. Still, it doesn’t feel paramount to me to know all the answers right now. I believe that God has figured it all out. TM – For me, it is easier to believe in God than Jesus. But here’s what I appreciate about Jesus. Before him, the whole concept of God was somewhat abstract and untouchable. I think Jesus became a tangible way for us to think of God. He lived on earth and he showed us what a life of kindness can be like. He also suffered and went through enormous pain. This feels to me like a reconciliation between God and man. He’s not only willing to empathize with us, but also to go through a human experience. I believe Jesus lived a life of complete dedication to what is divine, what is good and what is true. That’s why it’s important to me to be a Christian, rather than just being religious or spiritual. Jesus was not just a prophet or a messenger, but a way for God to show us how much he cared. In general, what I really appreciate is that New Church theology allows us to see the deeper meaning in the Bible. We don’t have to take everything literally. LJ – When I first began reading the New Testament, I found much of it completely impenetrable and totally puzzling, especially regarding the apparent anti-semitism: The Jews did this, the Jews are like that. Finding the writings of Swedenborg was so liberating. They showed me how to look beneath the appearances of the Bible to an inner meaning. BR – I believe that as new church adherents we are encouraged to use our minds and not simply acquiesce to orthodoxy. There should be a lifelong commitment to study, and it is inevitable that our view of the church’s teachings will evolve as we pass through different stages in our spiritual life. As I am now entering my 80’s I am generally less sure about things than I once was, less willing to make assertive judgments about people and situations, and generally more reflective. As the literary critics like to say, everything around me looks more nuanced. TM – To me, faith has to be a process, and one that involves life and action. That’s one of the things I like most about New Church theology. According to Swedenborg’s books, not only do faith and reason go hand-in-hand, but faith and action go hand-in-hand. CF – To me, faith doesn’t mean blind belief, but it means “living the truth that you know.” For me, this means living as if something is true. SS – There’s a scientific part of me that often questions my faith. But I don’t think I need answers to the scientific questions. In my perceptions – the things that I just know are true - I feel the presence of a God of love. That’s what I choose to follow. LJ – Growing up as a Jew, I thought of the New Testament as some forbidden text of another religion. When I finally read it, I was thrilled to realize that this was actually a continuation of the Jewish story. It was wonderful to realize that Judaism and Christianity are completely connected. JJ – Here in Australia, I was brought up with both the Church of England and the New Church. I never saw any conflicts between the churches’ doctrines. The main message I heard from both included belief in God, abiding by the Ten Commandments, and learning about Jesus and the message he was trying to give. BR – The revolutionary Christian idea that one could reach heaven from different religious traditions has great appeal for me. CF – I have a postcard with a message on it that I love: the New Church is not confined to one denomination, but encompasses everything. I believe in bringing this philosophy into fellowships and discussions. In Swedenborg’s writings, we learn that angel assemblies allow various people to come forward with their own understandings of things. When this happens, the various ideas meld together and people can walk away with something that applies to their lives. TM – I see Swedenborgian concepts becoming more popular in various Christian denominations, because the “new church” is really a state of mind, not a structure. I love the idea of the New Church transcending organized religion, and the broader Christian church becoming the New Church. Although the variety of responses spans a wide spectrum, the combined testimonials have a liberating effect. They lift us beyond petty textual critique and remind us that words are just that: words. By the way we choose to embody these words, we bring them honor and value. To me, that’s a paradox worth not only accepting, but celebrating.